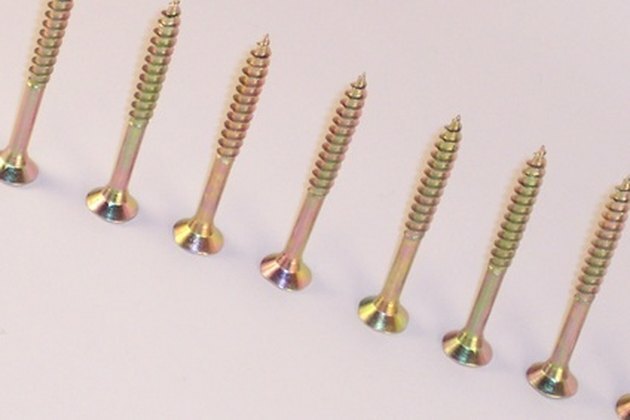 Screws provide tight and secure fastening as well as a cleaner finish than most nails and bolts. They are also simple to remove and adjust, making them a favorite choice for many applications. With so many different types of screws available, however, it can be difficult for users to select the right size screw for their needs. When choosing screws, consider things like length, gauge and fastening requirements to find the correct size screw for your project. The size of a screw is just as important as the type of screw you choose. Understand how screw sizes are listed. Sheet metal screw sizes are listed using three separate numbers. For example, 3/8 inch-16 x 1 inch means that the screw has a diameter of 3/8 inch and contains 16 threads per inch. A screw with this designation is 1 inch in length. Wood screws use only two numbers, such as 6 x 1 inch. This screw has a gauge of 6, which corresponds to a specific diameter, and is 1 inch long. Estimate the proper length for your screws. According to Better Homes and Gardens, screws should be three times as long as the thickness of the object they are fastening. For example, if you are fastening a 1-inch-thick sheet of plywood to your floor joists, you'll need a screw that's at least 3 inches long, which allows one-third of the screw to pass through the plywood and the remaining two-thirds to hold the plywood securely to the joists. Consider the diameter, or gauge, of the screw. Screw gauge is measured at the smooth portion of the shank, just above the threaded section. Gauges correspond to different diameter sizes, which are found in the chart listed in the Resources section of this article. The higher the gauge, the thicker the screw and the greater the level of holding power it provides. Consult the manufacturer's instructions first when selecting screw size. If your project comes with instructions, it's always best to follow the manufacturer's recommendations when choosing screws. Rely on general sizing standards for projects without instructions. According to Rockler Hardware, 6-gauge screws are best for molding and trim, while 8-gauge units are best for door and drawer pulls or knobs. 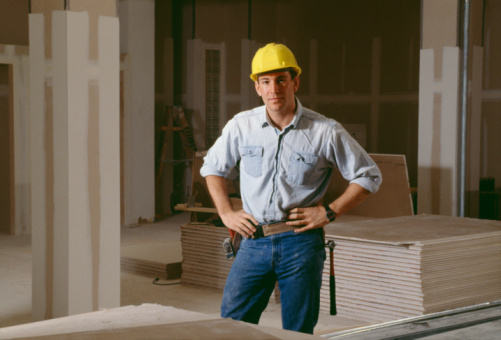 Deck construction requires 8- or 10-gauge screws, depending on the type of material, while most cabinets and furniture require 10-gauge screws. Choose break-away screws when you are unsure of how thick the object is. When fastening an object that you cannot access, or that you have little information about, use break-away screws. These fasteners feature tips that break off in 1/4-inch increments to accommodate objects of varying size and thickness. What Size Screws Should Be Used to Install Wood Decking? What Size Screws for 5/8 Drywall?